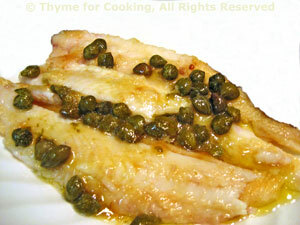 Thyme for Cooking's Main Courses: Veal Parmesan, Sauteed Sole, Pork Chops. A classic on every Italian menu, and one that is easy to make at home The veal is lightly breaded and quickly fried. We topped it with a slice of Mozzarella di Bufala, not traditional, but very good. You could substitute turkey cutlets or chicken breasts, pounded thinly, for the veal, but they will require longer cooking. 3oz (90gr) spaghetti if you make a circle with your thumb and index finger around the pasta it should be about the diameter of a quarter (American) or 1 euro coin; which is slightly less than an inch and more than 2 cm. Cook according to package directions. Drain. Mix bread crumbs and Parmesan on a plate. Crack egg into a flattish bowl and lightly beat with a fork. Dip both sides of the veal cutlets in the egg, then in the crumbs/Parmesan. Lay on wax paper or a plate to rest for 5 minutes. In a medium nonstick skillet heat 1 tbs oil over medium-high heat. Add veal cutlets and brown well on both sides, 2 - 3 minutes. Remove, put on a large, heat-proof plate and keep warm in a 250F (125C) oven. Chop onion and finely chop garlic. In same skillet add remaining tbs oil, onion and garlic and sauté 5 minutes. Add tomatoes, juices, sauce, paste, herbs, wine, and Worcestershire. Bring to a boil. Reduce heat and simmer, uncovered, 15 minutes. 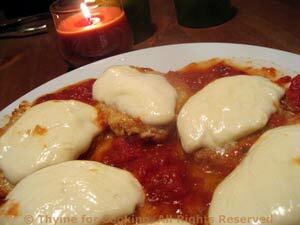 Remove veal from oven and put into pan with the sauce. Top with sliced mozzarella and cover until the cheese stars to melt. Arrange the veal on the warm plate, spoon some sauce around and serve with the remaining sauce on the side for the pasta. The Parmesan is for sprinkling on the pasta. A little bit of prep and an hour to bake, gives you a hearty casserole full of good food: cabbage, brown rice, onion, garlic, tomato; while you do something else. While rice cooks: Heat oil in nonstick skillet. Add onion, celery, garlic and sauté until tender, about 5 minutes. Add beef and brown, breaking it up as it cooks. Add Worcestershire sauce, herbs, chili powder. Add brown rice when done. 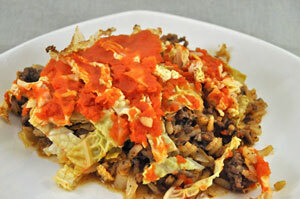 Put half (1 cup) of the cabbage into a baking dish, put the beef/rice mixture on top, then the rest of the cabbage. Press it down a bit, then pour the tomato sauce over the top. Cover and bake at 375F (190C) for an hour. This is an easy one-dish meal, quick prep work and 30 minutes baking time. The top is a simple popover batter that puffs up high, and gets a lovely golden brown. Heat 1 tbs olive oil in medium nonstick skillet over medium-high heat. Add chili powder and sauté 1 minute. 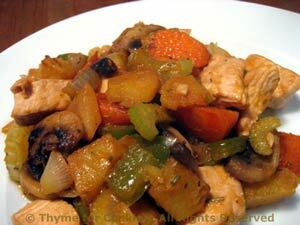 Add onion, garlic, green pepper, mushrooms and sauté until tender, about 5 minutes. 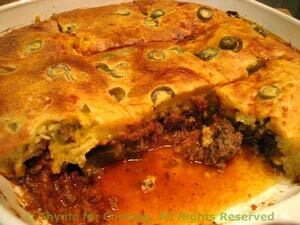 When done remove from heat, drain excess fat, and spread in a 10-inch (25cm) glass baking dish. Spoon tomato sauce evenly over the top. Slice olives and sprinkle on herbs. Sprinkle cheese evenly over top. Add milk, flour and salt. Beat lightly to just combine; a few lumps are okay - over-beating is not. Pour batter evenly over the top of the 'pizza'. Bake, uncovered, at 425F (215C) for 30 minutes or until edges puff up and are golden brown. Note 1: The quickest way to remove the sausage from the casing is to slit the casing, lengthwise with a sharp knife. Open the casing like a book and scoop out the sausage. Note 2: This is just a little too much batter for my taste; but cutting the recipe in half yields too little. You can use it all, (I have, and it works fine - just a bit too much to eat) but the last time I made it I ladled out 1/2 cup of the batter (and threw it out) before pouring it on top. This is a slightly spicy. slightly tart sauce, simply reduced a bit and served with the onions. Add paprika, cumin and sauté 1 minutes. Add onion and sauté 5 minutes, just until starting to brown. 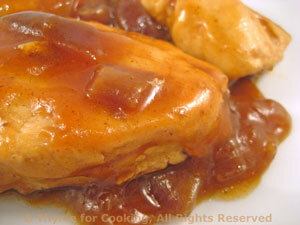 Move to the side, add chicken breasts and brown on both sides, about 8 minutes. Add vinegar, sherry, stock, cover, reduce heat and simmer 10 minutes. Uncover and reduce sauce slightly. Serve.